Harry Byrd was an apple grower in Winchester, Virginia. He was also publisher of "The Winchester Star". Harry Byrd was Governor of Virginia 1926-1930. He refused to borrow money to build needed roads, highways and bridges. 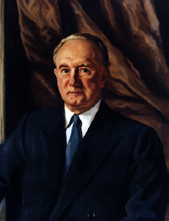 Harry Byrd became a United States Senator. Harry Byrd was opposed to Civil Rights for all Americans. His "Byrd Machine" denied the vote to black Virginians. Harry Byrd refused to accept the authority of the Supreme Court. His political machine closed schools to black students in Virginia. The "Byrd Machine" firmly ruled Virginia until his death. Netlinks for Harry F. Byrd, Sr.
Virginia Governors: Harry F. Byrd, Sr. Page created June 20, 2003. Anne Pemberton. Updated Mon, Feb 6, 2012. AP.